An educational system of neuromuscular re-education known for its gentle approach, the Feldenkrais Method has been shown to dramatically improve individual functioning by increasing self-awareness and facilitating new patterns of thinking, moving, and feeling. Intended for those who need to improve their movement repertoire for professional reasons–-dancers, musicians, martial artists, gymnasts, and athletes–-as well as those wishing to reduce pain or limitations in movement, Feldenkrais is based on the idea that learning to move better can improve anyone’s overall health on many levels. 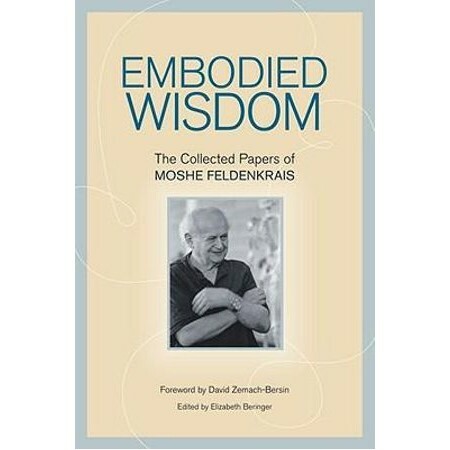 Using Moshe Feldenkrais’s own words, Embodied Wisdom clearly explains the basic principles underpinning his techniques, Awareness Through Movement (ATM) and Functional Integration (FI). These thoughtful articles and lively, sometimes humorous interviews explore a diverse range of subjects: the importance of bodily expression, the primacy of hearing, the mind-body connection, martial arts, sleep and consciousness, movement and its effect on the mind. Embodied Wisdom gives readers the opportunity to deepen their understanding of the scientific and spiritual principles behind the Method and offers sound strategies for incorporating it into their lives. Dr. Moshe Feldenkrais, D.Sc., (1904-1984) was a distinguished scientist, physicist, and engineer, and the founder of the method that now bears his name. His insights contributed to the development of the new field of somatic education and continue to influence disciplines ranging from the arts to physical and occupational therapy. Elizabeth Beringer studied directly with Feldenkrais and is one of the foremost teachers and trainers of the Method today.